I read two articles on Canadian aboriginals and I will compare Canadian to Australian aboriginals. Reading the article on Charlie Wenjack I felt sad. It was a tragedy. I wonder if this same tragedy happened in the Aussies history. Let’s find out . The land and life style of the Aussies is mostly similar to the Canadian aboriginals. 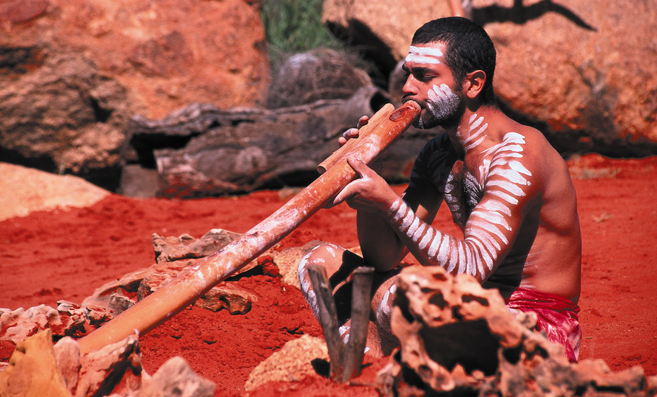 The Australian aboriginals moved around their territories depending on the weather. The Australians were hunters and plant gatherers. They got along with other groups and put no fences around their land. Each group has its own language and laws. Elder aboriginals told stories to the little ones. Each aboriginal had his or her, like women did a lot of making clothes and cooking food and men were in charge of hunting and gathering. They traded goods with other tribes. They played an instrument called the didgeridoo. There was a lot of food and no real worries in life for the aboriginals then. They had a lot of time to rest and share stories and grow their culture together. The aboriginals had ruled this land for at least 50,000-60,000 years. In 1770, Captain Cook, British explorer, landed on the southern tip of Australia. It was not called Australia back then. It was called terra nullius by Captain Cook meaning no man’s land. Although Captain Cook saw some of the aboriginal people, he decided it was no man’s land because they had no fences around their land (territory) like they had in Europe. In 1788, the fleet of Captain Phillip came to claim the land of Australia. He came to the area now known as Sydney where he met with an angry aboriginal resistance. They were shouting and shaking their spears, so he moved up north where only 5-6 warriors were and took over that land. In 1788, when the Europeans moved in, they took the land from the aboriginals. They cleared the land for farming and the aboriginals were forced to move to continue hunting. Also, the Europeans brought diseases from Europe that struck the aboriginals like bad spirits. As one of the Captains came he said “it’s a terrible sight coming in with all the dead bodies laying on the river beds. We saw at least 30 bodies laying dead.” It was a tragedy. The aboriginals were forced to ran away to the western side of the land. No matter what, even through one war, they could not beat the Europeans so they surrendered. Then they had to trade with the Europeans for food and clothing. They were given alcohol as well. Families no longer shared stories and time together. In 1949, the Australian government allowed only a few aboriginals to vote. Not until 1962 did all aboriginal get to vote. In 1976, the Aboriginal Land Rights Act was established. This act gave many aboriginals their land back. It wasn’t until 1992 that the high court came to a conclusion and realized that Captain Cook was wrong when he called Australia “no man’s land”. It was really “man’s (aboriginals) land”. In 1998, the government started a national Sorry Day to recognize the “stolen generation”. The stolen generation were children removed from their families between 1905 to 1967. Finally, in 2008 the prime minster made a formal apology for the stolen generation. The history of Australia is very similar to Canada’s. It took a long time of anger to realize what we did to the aboriginals and to say sorry. It took work but we finally came to an agreement with them and said more “sorrys” then the whole world could say one hundred times. When they heard this story, the tribe were greatly excited. They all spoke together, and few were heard. At last they agreed to invite the cockatoo to a great corroboree, and, while he was enjoying himself, to steal the fire. The day arrived for the great feast. There was dancing and singing, and mock fighting. Then they offered Mar a choice piece of kangaroo flesh to eat, but he refused it. He was then offered the kangaroo skin, which he accepted and took away with him to his camp. The f east was over, and still they did not have the fire. Prite, who was a very little fellow, decided to follow the cockatoo to his camp. He followed Mar over the mountains until he was very weary, and, just as he was about to turn back, he saw the cockatoo take the fire from under his crest feathers. He then returned to the camp and told the members of the tribe that the old man’s story was true. The absorbing question was discussed late into the night, and at length it was agreed that Tatkanna, the Robin, should make the journey again, and endeavor to steal the coveted fire. Early the next morning he set out on his long journey, and, after travelling for some time, he reached the camp of the cockatoo. He arrived just in time to see Mar take the fire from his crest and light a fire stick. With this stick he singed off the hair of the kangaroo skin which the tribe had given him. Tatkanna was so eager to steal the fire that he approached too close, and scorched his breast feathers-hence his name Robin Redbreast. When Tatkanna’s feathers were scorched he was very frightened, but, as the cockatoo had seen him, he decided to act boldly. Running to the fire, he seized a fire stick and made off. In his hurry he set fire to the dry grass around him, and in a short time the whole bush was ablaze. The fire roared like the sound of flood waters in the mountains. Birds and animals raced before it in their efforts to gain the shelter of the green trees. But it swept all before it, and left a smoking black waste behind. When a tall tree fell, a shower of golden sparks flew high in the air, and the red reflection of the flames in the sky was like the rising of the sun. When the cockatoo discovered that the fire was stolen, and beyond his control for all time, he was very angry. Taking his nulla-nullas, he went in search of Tatkanna to kill him. When Mar arrived at the camping ground of the tribe, Tatkanna, who was only a little fellow, was very frightened, and begged his friend Quartang, the Kookaburra, to take up his quarrel. Quartang agreed to do so, but he had not been fighting many minutes when he was beaten, and forced to fly into the trees, where he has remained ever since. Mar, the cockatoo, returned to his camp disconsolate. The tribe was very pleased with the robin for his bravery. When you see a red-crested cockatoo, you will remember how fire was stolen from him. He still has a beautiful red crest, and is known as Leadbeater’s cockatoo. The robin redbreast also retains his scorched feathers in remembrance of his great feat. Ton article est excellent. Tu as fait une très bonne recherche et j’ai adoré l’histoire du Cockatoo! Good job Wilson! What a remarkable resemblance between our aboriginal peoples history. Makes you wonder what they would be like if the Europeans had not invaded their lands. That’s something you might want to think about. ya i wonder if the europeans did not invade what we would be like. Hi Wilson your trip is so cool. I like looking at pictures of your trip. Didgeridoos sound so strange,but awesome at the same time! Keep posting photos of your trip its so cool. thanks cole glad your enjoying it. merry Christmas!